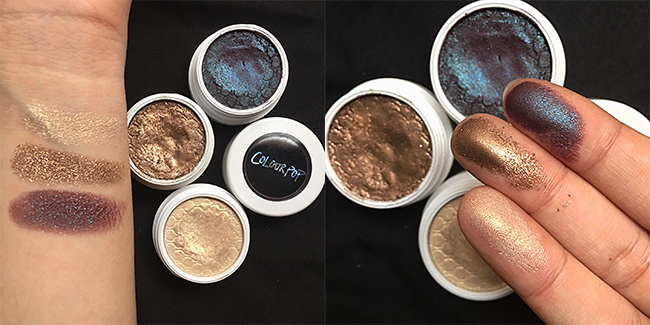 ColourPop Super Shock Shadows - Swatches! After falling in love with ColourPop lip products, I recently got around to getting a few Super Shock Eyeshadows! These are some the best-sellers available on the website so I thought to give them a go and see what the fuss is about! For maximum coverage: Use fingertip and tap shadow onto eye lid. A flat, fine tip synthetic brush will work fabulously as well and is actually better for a more detailed application close to the lash line. However, your fingertips make for the most intense application. To blend: Use a fluffy brush that has good movement, dip tip of the brush into the shadow and blend with a “wind shield wiper” movement throughout the crease of the eye. This will make your shadow softer and more diffused (like a total pro). When finished, close that sucker up tight! Don’t leave the jar opened for long periods of time, you may lose some of the magic that makes the Super Shock Shadow so amazzzing. Nillionaire- You'll be looking rich in this bronze with pink and gold ultra-glitter. Bae- Ay Bay Bay, this is a rich eggplant purple with blue glitter. Juicy Apple(discontinued)- Glitter sheer finish soft gold topped with gold glitter. I've never used anything like these eyeshadows before. The soft and smooth cream texture applies like a powder. I've found that it doesn't apply that well on the eyes unless you're using a sponge tip applicator. Juicy Apple was limited edition from the Hello Kitty collection but there are a few similar shades in the ColourPop range, the light gold shade applies very sheer with bright gold glitters. I love layering all of these on top of a cream shadow or color base. Bae is my personal favorite, it applies as a plum shade with blue glitter on the eyelids. Nillionaire is my go to for a little pop on an everyday eye look. The bronze shade is perfection! All of these last quite long on the eyelids without fading or creasing, just using a small amount and blend it is key to prevent creasing! For more information visit ColourPop.com, these are $5 each but usually cost between Rs800-1000 if purchasing from a Facebook page. You should definitely get Nillionaire again! It's my favorite and most used. 'Bae' is such a unique shade! Sometimes I don't know why I purchase any other eyeshadows when these are so rich and creamy. I have so many in my collection, and your post has inspired me to swatch mine and post it on my blog. I love your aesthetic! !